When a friend is on the mend, let them know you’re thinking of them with the Hurry up & Get Well! Chocolate Chip Cookie Jar. 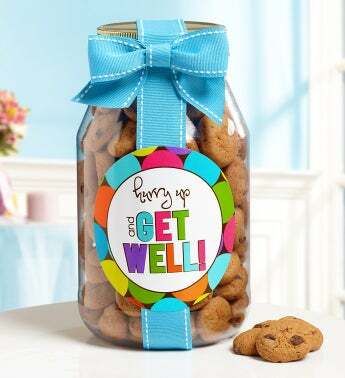 Filled with the tastiest mini-chocolate chip cookies they’ll ever eat and bottled in a resealable quart jar tied with a bright blue ribbon bow, this gift is sure to have them feeling better soon!